Syringes, Syringes with or without Needles and Oral Syringes. Scroll down to see our selection of syringes for sale. syringes are used in medical facilities and by individuals to administer necessary medications. We carry a selection of syringes for sale including syringes with needles, needless syringes and oral syringes. What is a syringes? 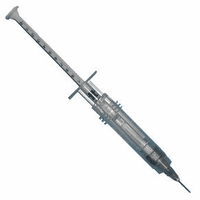 Syringes are medical instruments used to inject or withdraw fluids from the body. Syringes are a simple piston pump that consists of a tight fitting plunger, an open end to pass liquid or gas through and a needle, nozzle or tube. Most modern medical syringes are plastic and disposable, reducing the risk of spreading blood-borne diseases. Oral syringes help care givers and physicians administer the proper amount of medication through the mouth. These types of syringes sometimes have longer nozzles to reach the back of the mouth for patients that have trouble swallowing. There are many applications for syringes that can improve the way you take or receive your daily medications.